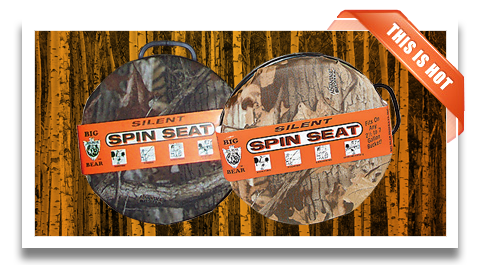 Whether your setting out on that perfect hunt, watching your favorite tip-up, or waiting for that perfect play, you'll find the Original Silent Spin Seat or 3/4 Ice Seat the perfect spot to wait. Comfortable and quiet, these seats will allow you to sit comfortably for hours, and will see you through years of use and activities. Made of sturdy plastic and covered in variety of durable fabrics, the foam cushion will find more and more uses the longer you own it. Securely attached to the top of any standard plastic bucket, it goes anywhere, is easy to carry and attach, and is perfectly silent. With the full-size Spin Seat, you'll get the added convienence of a swivel seat that is 100% silent - no moving parts to wear out or make noise. Perfect for hunting situations where you need to turn around and move a little without any added noise..
Don't need the bucket? No problem, just carry it along, you'll still get all the benefits of the padded, swiveling seat. Easy to use on any flat surface, they make great additions to the stand bleacher seating. The 3/4 Ice Seat fits those bleachers perfectly, and is small enough to be convienent to carry with all your other sports equipment. If you use your bucket for storage as well, you'll find the 3/4 Ice Seat a perfect solution. With a section of the seat removed, you'll have direct access the contents of the bucket without having to remove the lid each time you need to get in there. Perfect for ice fishing, it can hold all your supplies and your poles, without having to constantly open and close the bucket to use it. For sports, it easily holds baseballs and other equipment while providing needed relief from those long standing sessions at the game. Check out the gallery to see all the latest colors and styles. We're sure you agree, it'll probably be the best piece of equipment you'll add to your hunting and sporting season this year.